I can't believe it's already July, noooo!!! 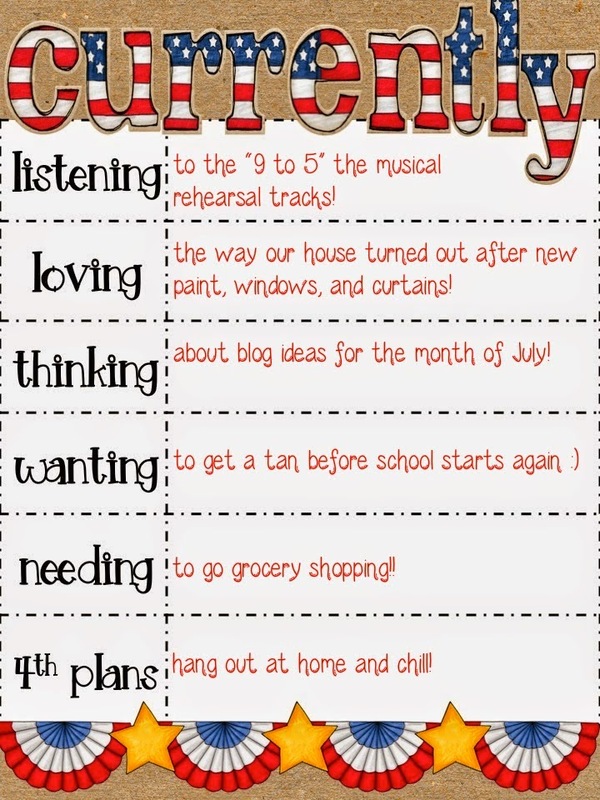 I'm linking up with Oh' Boy 4th Grade for the July currently! Loving: Now that we've settled into all our home improvements, I'm in love! Thinking: I hate when I get behind on blogging, so I'm trying to come up with ways to hold myself accountable so that I can share my experiences and resources. Wanting: The weather here in Illinois has not been amazing so far this summer, and I'm terrified of spiders, so I never hang out and get sun on the deck. I need to spray it down and spend more time outside! Needing: Oh man, our fridge is bare. This needs to happen today! 4th Plans: All of my family will be out of town in Texas, and we are dog sitting my parents dog (used to be my dog) Frankie, so I'm guessing we will just chill at home. We get to see fireworks every weekend with the Kane County Cougars basically in our backyard. I need my fridge filled too. This is a regular occurrence at our home. We have a lot of mouths to feed and they never seem to have enough. Rain and humidity makes for a hot sticky outdoor experience in Louisiana so I tend to stay inside.Have a great summer! Yikes! It's been hot and humid here, but that's not usually the norm. Stay cool! Did you get hit hard with the storms last night? I was pretty scared and spent a good chunk of he evening following the weather and being mentally prepared to run to the basement at any moment. Luckily, we avoided the sirens in Geneva. I've been on a crazy long blogging hiatus because I have had NOTHING to write about. At least nothing school related. It took until today (because I was procrastinating on those job applications) to finally get a post up! Any idea of any openings in your district? Did we talk about the fact that we both live in Geneva?? We had some openings a few months ago, but they were filled before school ended. I will definitely keep an eye out!